The fourth and final season of Star Wars Rebels kicks off today with “Heroes of Mandalore,” a two-part episode. The story follows Sabine Wren on a daring adventure to destroy a weapon that could wipe out all of her people. Basically, it’s the kind of big-stakes, big-action stuff we expect from Star Wars. However, as this is the premiere of the fourth season, I don’t want to recap as much as reflect. To me, these episodes felt like a great primer of what Rebels might be this year: a story that wraps up something for our major characters but also leaves huge question marks leading ahead. Whether that works or not remains to be seen. At the end of the two-part premiere, Sabine passes the Darksaber, and with it the leadership of Mandalore, to Bo-Katan Kryze. As the sister of former Mandalorian leader Satine, she has not only the respect of her people, but a rightful claim to leadership. It’s a fitting end to Sabine’s backstory tangent, as she has made amends with her people, grown as a person, been forgiven, and reunited them all. With Sabine unlikely to stay on Mandalore, she can now go off with the rest of the Rebels crew and finish whatever their story is; it’s a story we’ll see unfold as the fourth season rolls along. But, with Kryze now in charge of a seemingly united Mandalore, there’s a huge piece of Star Wars story just sitting out there. 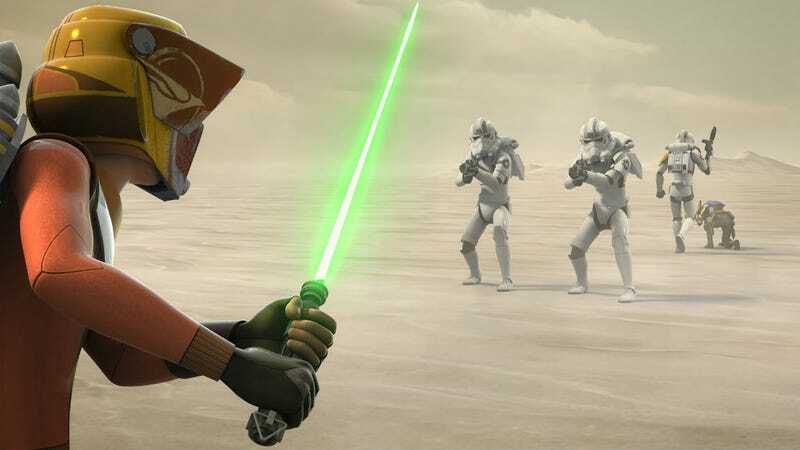 What have the Mandalorians been up to since this moment? Obviously, they did not choose to get involved in the battle between the Empire and Rebellion or, subsequently, the Resistance and the First Order. Is this a story that may one day be told? Could this be an in to a Boba Fett standalone movie where the bounty hunter explores his roots? It’s doubtful, but the way Rebels left the story, it’s at least possible. These are the kinds of big-picture Star Wars questions I’m okay with—ones that aren’t essential to our general understanding of the franchise, but are simply cool to think about. However, as Rebels gets closer to the timeline of the movies, the future of Mandalore is not even close to the biggest storyline Rebels has to wrap up. We need to have some answer to the whereabouts of Kanan and Ezra. Ahsoka Tano needs to return. The role of Grand Admiral Thrawn must be explained. The list goes on and on. And, if this episode is any indication, it seems like the show aims to do that while also leaving a few pages blank for more story to be told. And that’s why I’m a little anxious about all of this. For the past three seasons, right into this fourth season premiere, Rebels has been a shining example of the potential of Star Wars. It’s proof that the franchise works even without the big players. Sure, well-known characters make cameos here and there, but for the most part, this story has been about the Rebels crew, who are involved with the larger Skywalker-driven narrative, but never driving it. This final season will ultimately be the one that defines if that is a successful model of Star Wars storytelling. Part of the show’s success has always been the way it expertly weaved in and out of our baseline Star Wars knowledge. A brief glimpse of Luke. A few moments with Mon Mothma. Lando being Lando. It was never too much, but it was always enough to keep us on the edge of our seats. Now, though, Rebels has to somehow answer many of the show’s larger mysteries in satisfying ways, while not leaving gaping plot holes for the movies. It does not sound like an easy task. This episode showed that it’s possible on a smaller scale, but Sabine and the Mandalore are but a drop in the bucket. It’ll be a letdown if, in a few months, we’re watching A New Hope and thinking, “Couldn’t those three Force users the Rebels know about have helped out here?” In the past, though, Rebels has rarely let us down. It’s going to be a fun ride. Star Wars Rebels airs Mondays on Disney XD at all kinds of times. Set your DVRs.